Iowa’s State Supreme Court has struck down a ban on telemedicine abortions, saying the prohibition is unconstitutional. It’s the first time in more than 40 years Iowa’s highest court has considered an abortion case. It could also have national implications: other states have considered setting up a similar system to serve abortion-seeking patients in rural areas. The Des Moines Register reports that the State Supreme Court ruled Friday that the telemedicine procedure can be used, saying it’s the first time in more than four decades they’ve considered a measure having to do with abortion. Iowa established the telemedicine program in 2008: patients are treated by an in-person nurse, then do a consultation by video with a doctor, who then remotely unlocks a drawer containing the abortion medications mifepristone and misoprostol. The American College of Gynecologists and Obstetricians found telemedicine abortions to be safe; so did a prior, less anti-abortion version of the Iowa Medical Board. 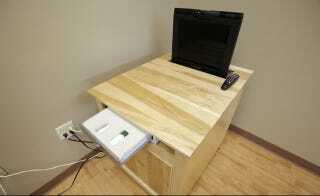 A telemedicine terminal with RU-486 in a drawer at the Planned Parenthood in Des Moines, Iowa. Image via AP.